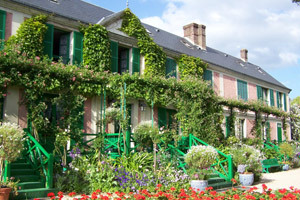 This tour will lead you first to Giverny a charming village in the south of Normandy, where Claude Monet painted most of his masterpieces as the Water Lilies. After the visit (on your own) of the house of the founder of Impressionism and the gardens created by Monet himself, your lunch will take place in a typical french restaurant. In the afternoon, you will discover Versailles, the wonder of the 17th century French architecture, a unique place to witness what was the opulence and abundance of luxury in which the Kings of France used to live. Once in Versailles, you will have the chance to visit the Hall of the Mirrors, the Queen’s chamber and the other rooms thanks an Audio-guide system that will allow you to comprehend one of the most important period of the French history. After the visit of the Palace you will have time on our own to stroll through the picturesque French formal gardens. TIP : During the high season the Palace receives a large number of visitors and the most crowded days in Versailles are Tuesdays and Sundays.